This Instant Pot Broccoli Cheese Soup just shines out as something special. The broccoli’s perfect. The flavor? Divine. (And that’s not a word I use to describe soup very often!) The texture is a silky contrast to the bits of broccoli and carrot. Creamy dreamy Broccoli Cheese soup – 15 minute Instant Pot recipe. With Cheesy Toasts. Leave the broccoli in bigger spears & cook it two minutes only. That’s it. Pressure is released immediately and quickly. We don’t like no stinkin’ broccoli. This soup has a roux cooked in the IP, normally a no-no. It’s a loose mixture & only cooked two minutes, so the recipe gets by with it. Make sure there is no residue on the bottom of the liner before bringing up to pressure. Be careful adding that cheese! You don’t want the soup hot hot hot or the cheese might seize up. Cook the aromatics in butter until they start to soften. Whisk in broth, add broccoli, cook 2 minutes high pressure. Remove broccoli and chop up – save some to put back into the soup and put some of it in the blender. In the meantime, set the IP to saute, whisk in the milk and toss in the shredded carrot. Add cream to the broccoli in the blender and blend up. Take out the whole instant pot liner with the soup from the instant pot coz it’s super hot and we don’t want the cheese to “break” or get grainy, which can happen if it’s too hot. Add the broccoli/cream mixture to the soup. Then add the pieces of broccoli to the soup. Then add the salt, pepper, and nutmeg. By now the soup should have cooled just a bit so it’s safe to add the cheese in small handfuls, stirring after each addition until it’s melted in, then adding the next handful. This is a lot of quick steps because everything goes so fast with the IP. Pretty much the same steps happen when making broccoli cheese soup without the IP, but there are more pans dirtied and it takes longer! And this really is the most exquisite Instant Broccoli Cheese Soup. 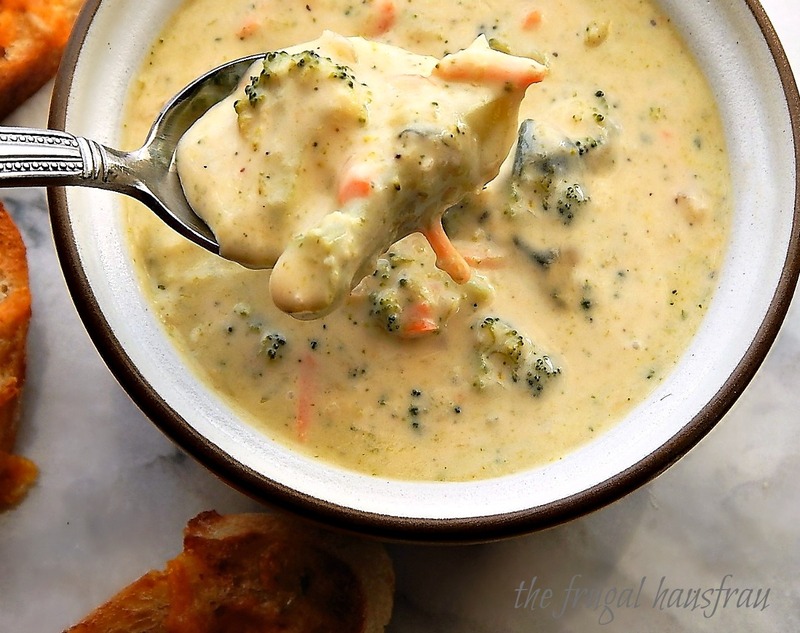 The most delicious Broccoli Cheese Soup with chunks of broccoli in a creamy, Cheddar soup. Press the Sauté button, High heat and as the pot heats, add the butter, onion, and garlic (and tarragon, if using.) Continue to cook until the onion slightly softens. Sprinkle the flour over the vegetables and stir for a minute, until flour is incorporated and the mixture starts to look a little dry. Whisk in the broth until smooth. Take care to make certain the bottom of the pot has all residue scraped up and incorporated into the liquid. Turn off Instant Pot (or press Cancel) and add the broccoli. Set the Instant Pot to Pressure, High heat, time 2 minutes. At the end of 2 minutes, immediately do a quick release of pressure. If anything other than steam comes out, stop the release, wait a minute and release in short bursts. Open the lid and turn the pot off. Remove broccoli and set aside. Add the shredded carrots to pot. Reset Instant Pot to Saute, low heat. Add milk to the pot, whisking in. Return your attention to the broccoli that’s been set aside. Chop some into rough chunks (to be blended) and some into small bite-sized pieces (to be returned to the soup when finished.) Blend the chunks with the cream. Add some of the liquid from the pot, if needed, to get blender going. Add in the blended broccoli/cream mixture. Stir in salt and pepper, add a small pinch of nutmeg (be careful, it can be strong). Stir in the cheese, a small handful at a time, making sure each handful is melted and incorporated before adding the next. Return the chopped broccoli to the soup. If the soup needs to be a bit warmer, replace it in the liner and set Instant Pot to Saute, low heat, stirring often. Do not overheat the soup or boil at this point, keeping in mind that even the low saute setting is very hot. Taste and adjust seasoning and serve. If you have a hand blender, feel free to use it instead of removing the broccoli and chopping and blending it. You may still want to remove the broccoli and chop some of it into bite-sized pieces to return after you blend. This entry was posted in Click here for Bargain Meals, Click here for Fabulous Food Posts and tagged Bargain Meal of the Week, Broccoli, broccoli soup, Carrots, cheddar, Cheese, Chicken Stock, Cream, Instant Pot, milk, Soup. Bookmark the permalink. Lindsey, I’m sorry to hear that; I make most of my instant pot soups with a roux in a separate pan and incorporate it afterwards except for this one – which is a super quick IP only recipe and the roux is very, very loose. I’ve never had an issue and I’m sorry you did – I’d like to know more because I want to this to work for everyone and I can revisit the method and change it up. Can you help me figure out what happened? Were you using a 6 quart? And not to double guess you, but just to make sure, do you think there was any browning on the bottom before you brought it up to pressure? I’d appreciate your feedback and thanks in advance. Can I use frozen broccolli? This was the strangest recipe to follow… way too many steps and some didn’t make since to me 😂Soup turned out delicious though! I’m glad you liked the soup, but you’re right it is a lot of little steps. Kind of a flurry of activity. Honestly, though, I really like great broccoli soup with the broccoli in little chunks so it is worth it for me. Of course a stick blender would simplify things but I have never had one I liked. I appreciate the feedback, though! Hi Donna, thanks for letting me know. I haven’t had this happen, but bringing up the butter/flour/broth mixture to pressure is a bit unusual. This recipe gets by with it because of the very short cook time and the mixture is thin. I suspect that when you tried to bring this up to pressure, there might have been some of the butter/flour mixture on the bottom of the pan that wasn’t mixed in. I just added to the recipe to make sure that there was no residue and the mixture (roux) was fully incorporated into the broth. I hope you managed to salvage and finish the soup – how did it turn out in the end? This soup looks yummy I have to try it! Thanks! Hope you enjoy it and I appreciate you stopping by! 🙂 Thanks for the link up!! Broccoli and cheese?Well done, great combination!Will definitely try it!Thanks for sharing! I have been looking for a good reason to bring out the IP and try more recipes!! Looks like this will be next on my list. 🙂 So happy it’s finally getting cold around here. My pleasure, Jhuls, and thanks!! 🙂 And thanks for hosting, too! Thanks Monika! The Instant Pot did such a good job with it, and the broccoli stayed so fresh and green. Happy FF!! Mollie this is a fantastic recipe – love the cheddar and broccoli combination – I’ll be giving this a go! Thanks, Laura. I have more broccoli but am just trying NOT to make it yet again! I hope you like it as much as we do. The tarragon imo, makes the soup. This is one soup that doesn’t freeze, so you can’t count on that – but it’s good enough that I didn’t mind eating it every day for a couple of days!! 🙂 What a great price on broccoli!! I love the IP. I was just talking to my sister who told me if I get as intense about as the people on the Instant Pot Facebook page she was gonna cut me off! People are very passionate about their Instant :Pots and I can see why. I have used a stove pot pressure cooker for years but the IP just is so much easier and there’s no babysitting. Some of the appliances are so complicated – but the IP has a learning curve, too. And it has a crockpot feature, but so many things that can be done in the crockpot can be done in a fraction of the time of stove or crockpot so I’ve only used the crockpot function once. I would never guess that you love your instant pot so much. LOL! Yeah…luckily not as much as the FB people…yet!! I made it this way so it would minimize the possibility that the broccoli would be overcooked, and there is actually very little liquid in that first two-minute cooking, so the pot isn’t overly full. I don’t think you’ll have any issues with it! But that did remind me that it is a good idea to always mention when releasing, that if anything seems to be spurting out other than steam to wait a minute and release in short bursts. That might have been your issue, especially if the pot is fuller and if the broccoli is so overcooked it’s falling apart. All those little pieces that fall off the head of the broccoli can fly up with the release and clog up the release valve. Oh yes please, love broccoli and cheddar soup. I am really thinking about this instant pot. It sounds like something that is so useful. Suzanne, I was skeptical but I love it! I just bought some broccoli yesterday! I’ll have to make this real soon, via the standard method since I don’t have an instant pot. I think the flour mixture would burn in a pressure cooker? Not in this case because it’s really only cooked for a couple minutes at pressure. I’m going to post a wild rice soup soon, but it takes 30 minutes, so I stir the flour/butter at the end. This would be excellent on the stove-top, too. I didn’t include a recipe since I already have the other two on my blog! That’s how much I love broccoli soup! Hi, and yes, it really is, isn’t it! Especially this time of year!